Evangeline Elder and Carmena Woodward were sick of the boys’ club. “2013 to 2016 was a bro fest. Every party!” reminisced Elder of Oakland’s party scene. Now, the two women are the principal organizers behind this week’s Women in Music Festival — a series of events over the course of four days that includes performances, parties, panels, and a marketplace, all centering women in the world of music. 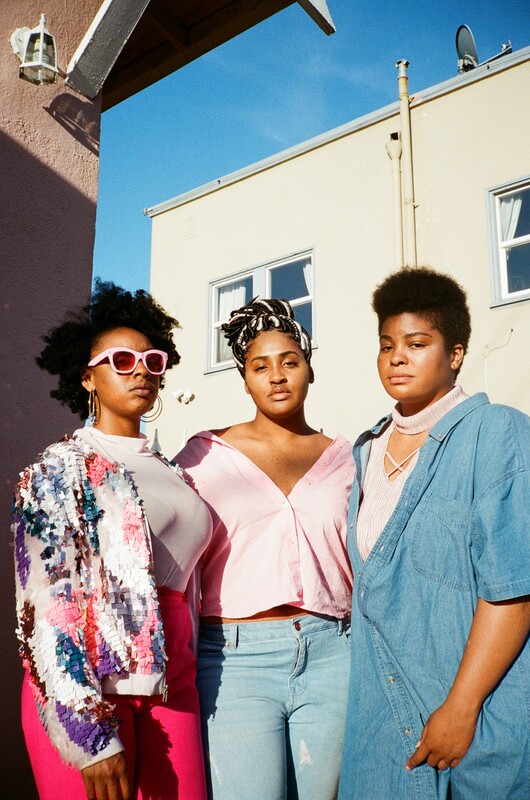 The festival is a community-oriented and women–led response to an East Bay music scene that, when it comes to women, Elder and Woodward argue is isolating at its best, and misogynistic at its worst. During a recent interview, the two explained in detail the sort of parties they experience in the Bay. For example: there’s a stage, a male DJ plays a mix of current hits and hyphy throwbacks, while flogged by an all-male entourage, some documenting the occasion on their phones, the rest performing renditions of viral dance moves of the moment. The main floor mirrors what is happening on the stage, but with some women and wallflowers sprinkled in. It’s no doubt a joyous scene. But it’s also not for everyone. As a San Francisco native, Woodward was entrenched in hyphy music and the culture around it in the early 2000s. She even listed off an impressive collection of old-school scraper cars she owned during that era (a Regal, a Park Avenue, a box Chevy, for those curious). And she explained how she held three jobs at a time, since she was 14, to afford the lifestyle. She hustled through her college years, as an intern with KMEL’s street team. But she quickly grew disenchanted with the male-dominated world of party promotion and transferred to college in Southern California. There, she developed an interest in deejaying but had a hard time securing a mentor until her uncle agreed to show her the ropes. She opted out of parties, instead staying at home and practicing her craft. The rejection didn’t stop her ambition, though, and she eventually made her mark with “Champagne and Cupcakes,” an event series that showcased everyone from women entrepreneurs and DJs to chefs and photographers. Unknown to Woodward, Elder was creating a similar platform online and plotting a move back to her hometown of Oakland after finishing college. Elder, also known as Vang to her friends, founded Rehab Online Magazine in 2013, as platform to curate music and wellness as practiced by women. “[Rehab’s] motto was ‘gossip free,’ no matter what,” she explained of music blogs’ tendencies to proffer tabloid news. At this time, Elder also set her eyes on producing events, and looked for partners, “I went to people locally who I thought were poppin’ in the scene and could help me out. And they’re men and they all rejected me,” she told the Express. The two linked up and commiserated on their shared experiences in the male-dominated industry. “We’ve both had to negotiate and scrap throughout the years to make sure we’re getting the right price.” says Elder of the financial bias amongst others that came with being a woman in the industry. Collaborating on events came naturally. Elder even asked Woodward to come on board as tour DJ for Richmond R&B singer Rayana Jay, whom she managed through her music and marketing company, All Angles Agency. Woodward had been a fan of Jay’s since her first mixtape, XXI, came out in 2015, so she agreed to finally go on tour. “There were no artists that made sense until Rayana,” she explained. With the ascendance of Jay (who along with Woodward opened for Kelis this past February) and other rising stars whose careers she has a hand in, Elder says there’s the perception that she’s the exception in the scene, as a woman who’s experiencing success. “And that’s not the truth,” Elder argued though she ascribes the “female touch” as being the source of intuition and balance core to her success. Enter the Women in Music Festival: Besides being women-centric and vibrant space, she’s hoping the festival spurs more women to learn about what it takes to succeed in the industry. The Women in Music festival has gained momentum, securing sponsorship from local and national companies, most notably SoundCloud and Pandora Women. The goal was to make it affordable and accessible — it’s under $30 for a pass — and expose attendees to an uncommon variety of women in music, from talent buyers and artist managers to producers and content creators. Essentially, the lineup is stacked with women willing to share their wisdom. “Everything seems to have led to this,” said Elder. “This is the most meaningful event for me. I didn’t want to get much out of it, but I’m getting everything out of it,” added Woodward. The Women in Music Festival runs April 6-9, $25, various locations, WIMBayArea.com.